← Kristen Stewart’s hairstyle: since when did extensions become scandalous? 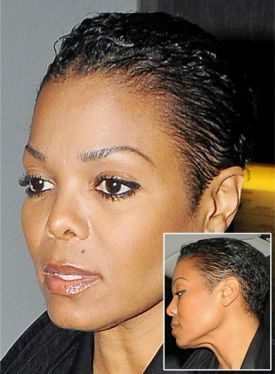 Janet Jackson’s hairstyle: her buzz cut grows out magically! You may be wondering why we’re so fascinated with buzzed haircuts. We really don’t know the answer, but it could be because the celebs who wear them are some of the gutsiest women we know. Of course they have the freedom to cut off their manes because they look great in any hairstyle. We’re wondering if this is the making of a mini trend with Janet joining other bare heads like Solange Knowles, Agyness Deyn and the beautiful creature of Splice. Today we were going to feature them all together but there’s too much good stuff to pack into one post. So… here’s an update on the one and only Janet from the infamous Jackson family. The Nasty singer was first spotted in a crew cut on May 20th, so naturally the next day her new do dominated the headlines of style and gossip news. There were only a few candid photos (not very flattering, above right) showing Ms. Jackson in her barely-there hair that had a super-high shine. A few days later (above center) it looked like Janet had grown out her hair overnight when she appeared at a London preview screening of Why Did I Get Married Too? With a long full crown topping the buzz, there’s no question that the look was artificially enhanced. The star’s sheer magic just goes to show you that even a buzz cut can look longer than it really is. It helps to have access to a celebrity hair designer, but real women could do the trick with good hairpieces and a talented hairstylist to show them how. Another day after her hair was buzzed (June 3rd in Harlem, left), the star was spotted in a fabulous fake on the set of For Colored Girls Who Have Considered Suicide When the Rainbow Is Enuf. For her third movie with Tyler Perry, the super-short style is slightly longer on top and has long bangs. This style and the wavy upsweep without bangs just goes to show you that it’s possible to get variety with short hair. The new movie coif has to stay consistent but that works out great for Janet who is showing up with similar shortcuts on TV appearances. While she’s getting a break from extensions, we wouldn’t be surprised to see her go long or in-between sometime soon. 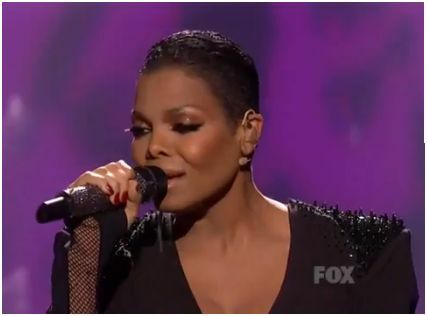 Getting back to the buzz, Janet really showed it off at the finale of American Idol. Many reviewers say she stole the show with her shorn hairstyle, trim figure and Michael-style dance moves… not to mention her much-loved voice. Again, Janet enhanced the simple short with a glossy finish. Finally, we wanted to compare a couple of Janet’s old hairstyles with the new. While she looks cute in long ringlets and bangs, the excess hair overwhelms her delicate face. Another time she was wearing dread locks for a visit with her brother Michael. This time the hair was off the face, which is good, but the length, texture and wide headband were too much for Ms. Jackson. We could show you plenty of pretty pix of Janet in long hair, but we like to see the soft-spoken star make a strong statement with her hair. Many of you must agree: a poll on Janet-online.com shows 88.88% of fans are in favor of the crop. Don’t worry if the buzz cut annoys you… it won’t be around for long! This entry was posted in Celebs, Movies, Music, star hairstyles, star makeovers, TV and tagged Agyness Deyn, American Idol, buzzed haircuts & how to change them, For Colored Girls Who Have Considered Suicide When the Rainbow Is Enuf, Janet Jackson in Tyler Perry movies, Janet Jackson's new hairstyle, Michael Jackson, ringlets, Solange Knowles, Splice, straight hair with bangs, waves, Why Did I Get Married Too?. Bookmark the permalink.